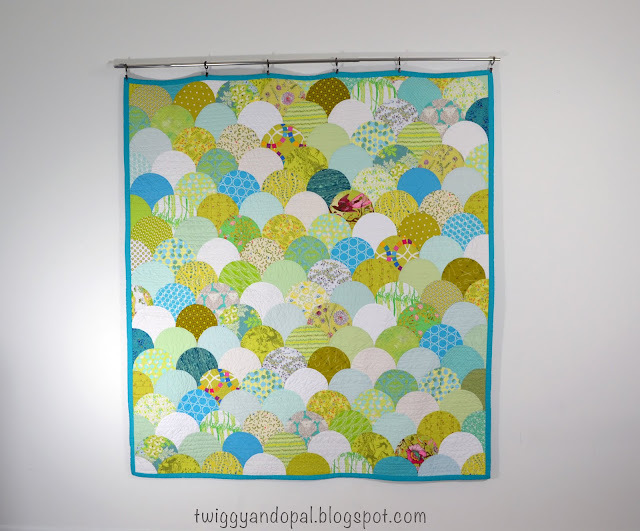 Twiggy and Opal: Happy As A Clam :: It's A Finish! Happy As A Clam :: It's A Finish! I. Did. It!!! It doesn't seem real! I knew when I started this quilt that the biggest hurdle would be finishing it. There were times when I wanted to stuff it in the back of the closet, or worse! But I didn't. I kept my wits about me (for the most part), hoping that if I stay calm and in control this quilt would not get the best of me! One day I might give it another try. For now I will revel in my finish, but will say it again...this quilt was awkward for me to make! Even so there is no denying the beauty of the Glam Clam! Not only did I finish it, but I used a ton fabric from my stash! Between the front and back there has been a significant decrease prints that have stared longingly at me for years screaming 'Pick Me! Pick Me!'. And of course...I never did. Instead, I let them languish on a shelf because I never knew what to do with them! Prints. My arch enemy! My nemesis! The good news is it didn't hurt half as much as I thought it would using prints, and it gives me hope for those other purge worthy fabrics I have! Clams are quite pretty! Regardless of the minor issues here and there, I do recommend giving it a try. I may have had problems on my end but that doesn't mean you will! There wasn't a lot of time between finishing the top and quilting the top. Which is not usually the case. I set about taking all my undesirables and piecing together the back. The more the merrier! It only meant that I wouldn't be left with any of it in the end. You gotta love a scrappy back! It was a matter of laying out each piece and figuring out the puzzle! On to quilting! Because there were a few bumps in a few seams, I opted for wavy horizontal lines spaced randomly. Once the first lines were laid, I went back and added more. I used Aurifil Thread #2310 Light Beige for the blending factor. Which it did perfectly. Then I had the idea of circles, pebbles or as I was calling them 'pearls'! It wasn't until I finished adding the pearls that I realized Clams don't have pearls inside them...Oysters do! One of those palm to the forehead moments! When I took the Glam Clam class with Latifah Saafir, she showed us how to make a wide binding. I tried my best to follow my memory and cryptic notes for the binding and I guess you could say...not bad for the first time! Size does matter! This is a 1" binding and quite a difference from my usual 1/4"! One place that matters is the corners. I had a difficult time whipping them into submission! Having done this chunky binding once, I'm really looking forward to giving it another try!! I like it a lot! I used Kona Breakers for the binding. 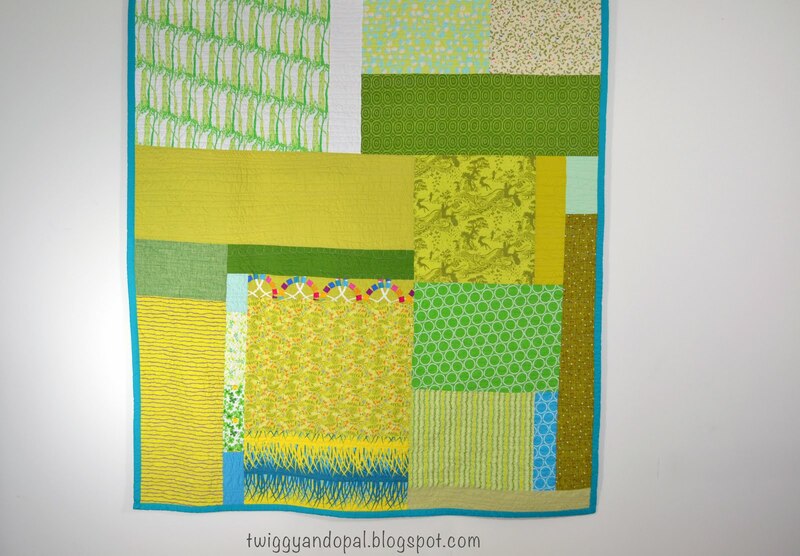 The color and the width perfectly framed the quilt! After washing this quilt finished at 63" x 69". A pretty good size lap quilt. If I was do another, I think I may take a clam or two out of each row. I guess I can make that decision when I get to it! It does feel good to have a full quilt finished finally! I hope you like the finish, the eye candy! I know I'm excited about it! Love, love, love all the colors and prints! I'm not exactly a new kid on the block, but there are several prints I don't recognize. Beautiful finish! 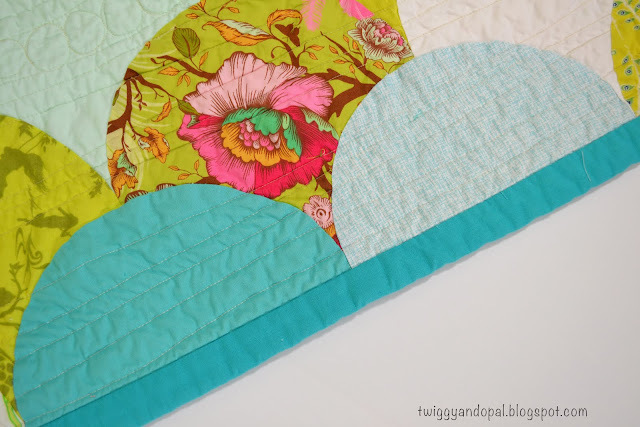 Being a sorta new quilter (but coming up on three years! 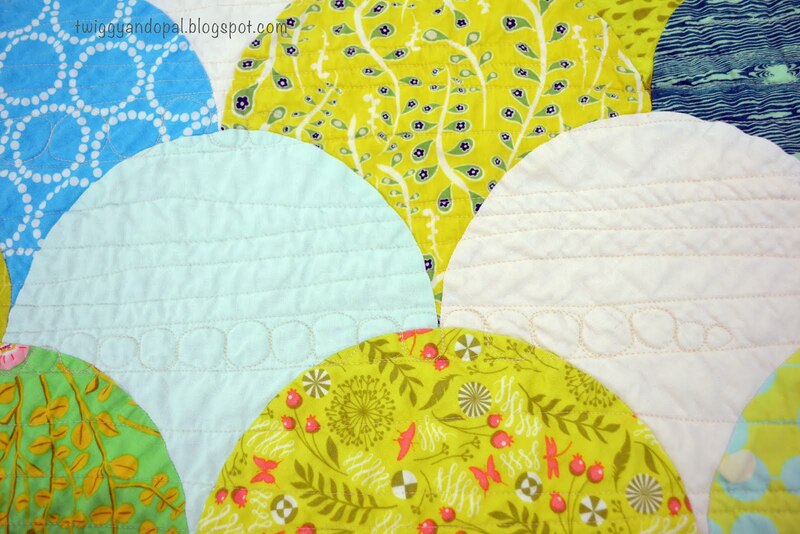 ), I appreciate reading blog posts about when other quilters go out of their comfort zone. That's still where I am A LOT of the time. 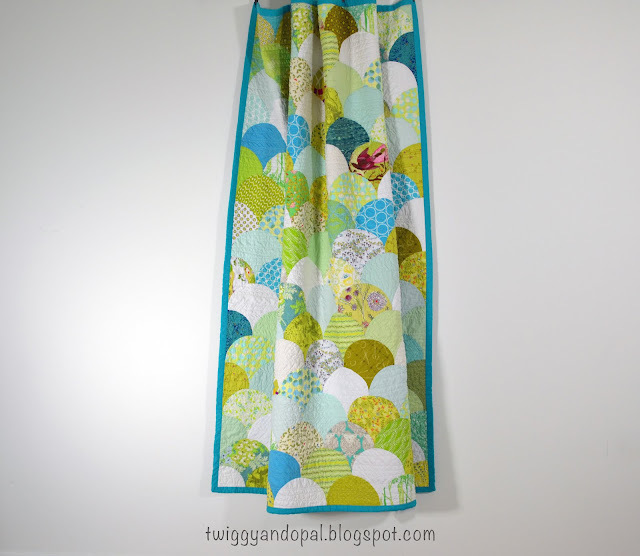 Curvy quilts aren't in my repertoire yet, but maybe someday. I think your Glam Clam quilt is so striking. I'm wondering how wide you cut the strips for your wide binding? I love its chunkiness! Way to go, Girlfriend! Can't wait to see it in person. Beautiful!! I have never tried wide binding . . .
Glam Clam is besutiful, Jayne! I love the colors you chose - especially that light blue contrasting with the yellow green. So pretty! Good for you trying something that wasn't easy and having a wonderful finish. Pretty! I have been wanting to try a wider binding - maybe I will have to give it a try. Thanks for sharing with Oh Scrap! Love your Glam Clam quilt! It definitely turned out very pretty. Since I am curve challenged I will probably never attempt this pattern. I like the wide binding, too, I just always do a thinner binding out of habit. As always, great job. Nadine Willis in HOT Northern California. I LOVE IT. It's so pretty, and I love the wider binding. I may have to try that on one of my next quilts. So pretty, you did a fabulous job! 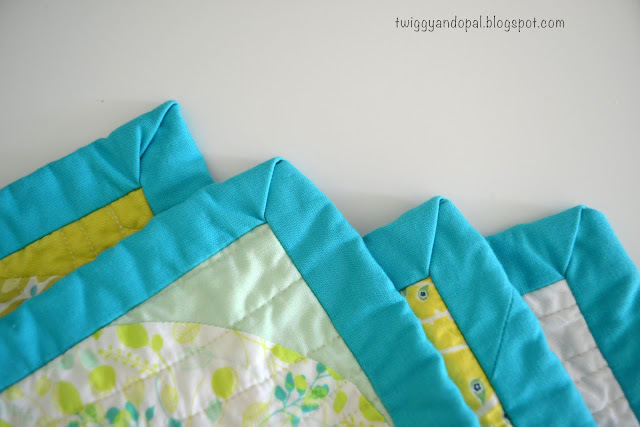 The colors are so good together and Breakers as the binding was an inspired choice. The wide binding is a nice frame for a busy quil, too. Way to move along and get this one completely finished! Beautifully done! Love the colors. Congrats on using up some your aged stash, each piece worked out nicely. Those prints are so gentle and blending in well, almost like solids, except for the bird and the flower. The colors go so well together. Love the back as well. Congrats on a fine finish. This is so beautiful! I have to try clams too. I have a request for you - Make something ugly. I knew you could not do it. It's really awesome, I am so happy for you that you finished it up. Prints are fun to work with, but for me I find the secret is to add in some tone on tone's with them. 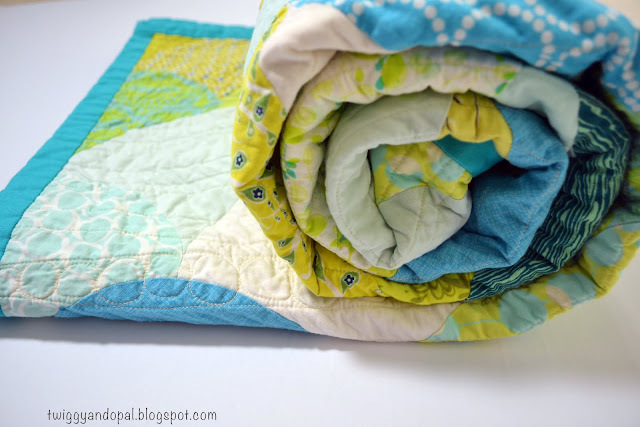 I love this quilt and especially the colors you used! It's a refreshing look! It is gorgeous Jayne! Well done! A clam quilt is on my wish list to do one day. Congratulations on a well deserved finish, and the binding is spot on, it sets it off beautifully. I don't think I will ever be as brave as to make one but I so admire you for doing so. The colors in your clam quilt are gorgeous! You should be super proud of this finish Jayne, it looks wonderful. It's a gorgeous quilt Jayne ! 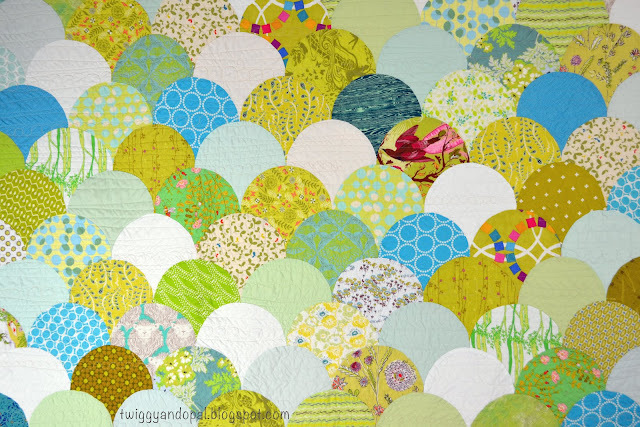 Ooh, fantabulous clam quilt!! I bought acrylic templates for making a giant clamshell quilt (9" clams, I think?) and am planning to use a mix of solids and Tula Pink's Tabby Road prints. 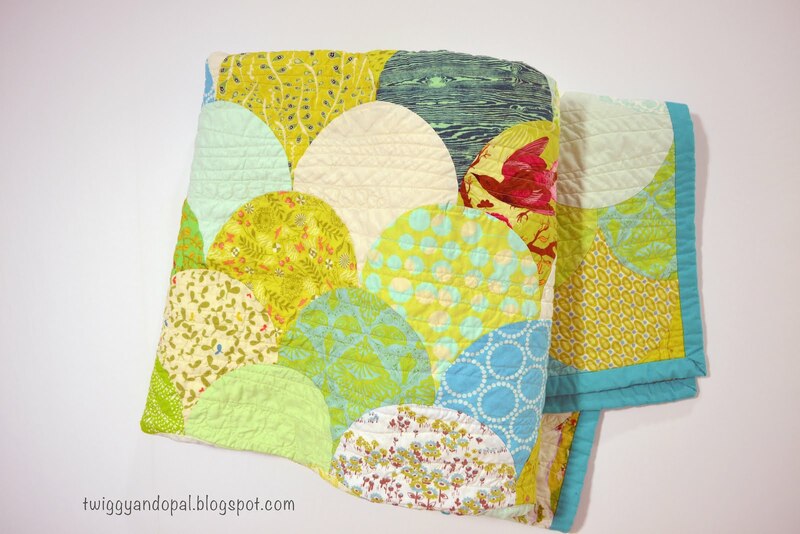 What size are your clam shells, and do you know how many of them you needed for this quilt? Home Again :: And A Little Fabric Too!